Brighton Morris Men can trace their origins to the University of Sussex in 1966. Originally called the University of Sussex Morris Men, we still dance in the University’s colours of gold, wine and purple. 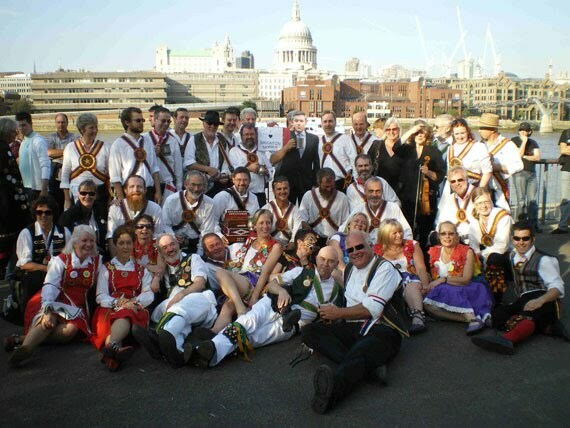 The side owes its origins to the Chanctonbury Ring Morris Men, who under the auspices of the Morris Ring, had been encouraged to ‘spread the word’ in the University. The side consisted of students who, on completion of their degrees would either move on to Chanctonbury Ring (lower 2nd class and thirds), or stay with the University side (Firsts and upper 2nd class). John Samuels and Steve Evans left the University side for Chanctonbury Ring. Malcolm Smale danced with both Chanc’s and BMM for a season, then decided to stay permanently with BMM. John Allen made the journey from the Ring to the University when he started his PhD. In the late 1970’s the two sides began to go their separate ways. Keith Trampleasure was the last squire of the University side. At the end of the Summer of 1982 the side changed its name to Brighton Morris Men. Malcolm Smale was its first squire. The two sides remain on good terms with each other and dance out together once a season. The side currently has two seasons: Practice from the 1st Thursday in October to April and Dancing Out from St George’s Day until Autumn. New members are always welcome to join at any time and learn some of the 30 or so energetic dances we regularly perform.